My postseason adventure began on Friday, November 8th at Ralph Wilson Stadium in Orchard Park, New York. After having watched 50 games during the 11 regular season weeks, the trek began again. New York is structured similar to Pennsylvania. The state is divided into sections, and each section conducts their own playoffs. Then, the sectional champions play each other in five classifications for a state title at Syracuse University’s Carrier Dome. Similar to Pennsylvania’s former nature, the Long Island schools, though part of Sections 8 and 11, do not participate in the state playoffs. Rather, they play for a combined Long Island championships. The Public and Private schools of New York City, opt out of the state association completely. The public schools participate in the Public School Athletic League (PSAL), and are split into three levels (Championship, Bowl, and Cup). Also, the private schools have their own association. Though private schools are not restricted from the NYPHSAA in general, the Buffalo area private schools in Section 6 are members of their own association, the Monsignor Martin Athletic Association. There are currently 6 teams in the MMAA. Now, as I mentioned. New York has five classifications (AA, A, B, C, and D). They do, however have some sections with a six classification, labeled DD. These teams are treated differently. Some sections do not even have DD classified teams. Some hold a joint-title between the D and DD champions to move onto the state playoffs. And others, like Section 6, simply crown a Sectional championship and that’s as far as the DD team will advance. Section 6 AA has 9 teams in one league, Section 6 A has 18 teams in three leagues (North, Central, and South), Section 6 B has 17 teams in two leagues (North and South). Section 6 C has 14 teams in two leagues (North and South). Section 6 D has 5 teams in one league. And Section 6 DD has 7 teams in one league. Section 6 covers from midway between Buffalo and Rochester westbound to Pennsylvania and due south to Pennsylvania. 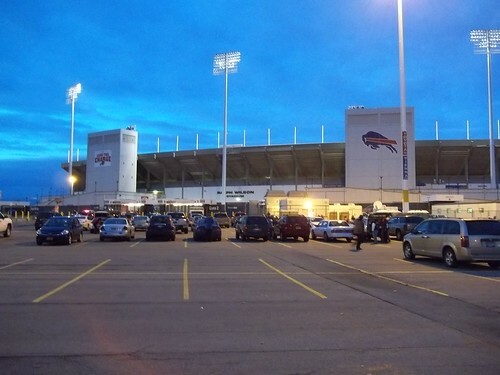 Since near it’s construction, the championships have been played at Ralph Wilson Stadium, formerly Rich Stadium. Unlike other large stadiums hosting games, the seating is limited to only one side of the field. Also, from roughly goal-line to goal-line. Because of this, you’re constantly looking across the field at an entirely empty stadium. And unlike other states, they strongly restrict fans from interacting by placing a movable barricade down one aisle near the 50 and station officers near the barrier. Anytime there was trashtalk across the line, the officers would step in and say if it kept up that you’d be ejected. They were desperately trying to keep things civil. For scheduling, the D and A games were played on Friday night. While the DD, B, C, and AA were played all day on Saturday. Unlike other massive NFL stadiums, the ticket office is separate from the stadium, located next to the training facility. This stadium, if you’ve never been there, is surrounded by acres of parking lots. Parking was free, which is a bonus, and tickets were absurdly cheap. $7 for both days, which amounts to $3.50/game for Friday and $1.75/game for Saturday. Even with dealing with slightly higher concessions, it is a good deal. Only food I got on Saturday was pizza. It was rather good for stadium pizza. Now, for the games. Because New York only plays a 7 game regular season, and how little high school athletics are regarded in New York compared to the likes of Ohio or Pennsylvania, it was minimally attended. However, the fans that were there were just like in any other state. Cheers, chants, student sections, etc. Because of how few teams there are in Section 6 compared to six championships, these teams generally make regular appearances here. Maple Grove and Chautauqua Lake formed a sports co-operative this year, but it worked as they reached the Sectional championship. Williamsville North (a team I was planning to see earlier this year but the game was postponed) beat Sweet Home, which had won six-straight sectional championships. I, however, was on the Sweet Home side mostly because I couldn’t cheer for a team that cost me an entire day’s drive to Buffalo and back only to find out after arriving at their stadium that the game was postpone but hadn’t publicized it. On Saturday, the small school title went to Frewsburg, over a consolidated Cattaraugus-Little Valley team. Fredonia had the best nickname of the bunch, named the Hillbillies. Depew and Alden were rivals just east of the Buffalo metro area. And lastly, Jamestown has been a big school power in Section 6 for quite some time from the southern border near Pennsylvania and took it to Frontier, out of Hamburg. Who are just a few miles from the stadium. This was a rare appearance for Frontier. The benefits of the week were cheap tickets, free parking, ample seating and some vocal yet small crowds. It’s something I’ll plan for next year. The next week started where the last week let off. Luckily the Monsignor Martin Athletic Association semifinals are held at Ralph Wilson Stadium on Thursdays (and the championship is also on Thursday during Week 13). I had purchased tickets the previous week. Tickets were also $7 and parking was once again free. Now, the MMAA currently only has six teams. All six make their playoffs. The two quarterfinals were held locally. Previously the MMAA had a big and small championship, which is what led Cardinal O’Hara to their long win streak, in part. However now they were one of the also-rans. I had previously seen two of these teams play in Steubenville. The first game was between St. Joseph and St. Francis. The nightcap was Canisius and Bishop Timon-St. Jude. St. Joseph was a long time opponent of Steubenville and Bishop Timon-st. Jude had played at Harding Stadium in 2012. The early game ended with St. Joseph running away with the game and Canisius crushed Bishop Timon via shutout in the second game. Friday was a choice of games. Being in Northwest Pennsylvania, I opted for a local matchup instead of driving back to the Ohio Valley. That led me to Cinderella story Lakeview of Stoneobor Pennsylvania. A small 1A school in Mercer County, these team had never done well. Led by their star, Blake Reddick. Being the best team in District 10, they got a comfortable matchup at Wilmington’s Greyhound Stadium in Week 11. Now, in Week 12 they were hosting fellow Mercer County rival Mercer Mustangs against Wilmington’s Greyhound Stadium. This was my first trip to Greyhound Stadium. The field turf is a little matted, which makes viewing line markers in the bright lights a tad difficult. The stadium itself was a simple aluminum and steel structure as most high school stadiums are. There was a rather nice archway to pass through when you enter where the ticket windows and concessions are. Also gives an enclosed area to sell programs and raffle tickets. They also proudly display a banner for the 2008 State Championship. As for the game, Mercer was trying to make a game of it. But Lakeview was just too much for them and ran away with it in the second half. I had already planned for a doubleheader on Saturday somewhere in District 10. Much to my dismay, District 10 had completely convoluted the matchups for the 2A and 3A semifinals and instead there were no doubleheaders. 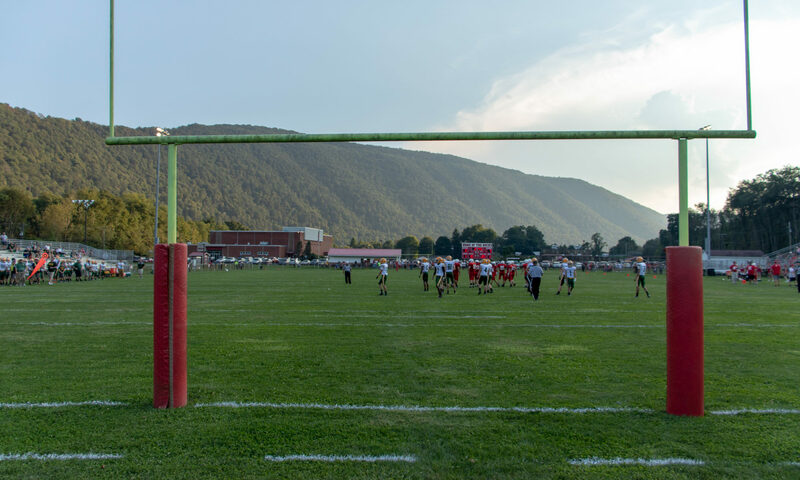 The only early game anywhere to attend was in DuBois out in District 9. They, themselves, were hosting a doubleheader at noon and 6pm for their 1A semifinals. The early game was Curwensville vs. Redbank Valley. And the night game was the game to watch, between Clarion and Brockway. My former high school, Greenville had their District 10 2A semifinal matchup scheduled for Erie at 7pm against Girard. The decision was weather to just see the DuBois doubleheader, or drive between the two sites at roughly 150 miles. Or only see the Greenville-Girard game and forgo an early game. If you know me, only seeing one game wasn’t a real option to consider. The drive to DuBois went relatively well. My old car was closely reaching the end of its useful life. However, I still made it by game time. EJ Mansell Stadium in DuBois is a beautifully old brick and concrete structure. Arched supports as the facade and a great close view of the field despite a track. The visitor side looked rather small. The scoreboard was to the south, which meant looking to the sun to try and see the time remaining. Luckily the large protrusions at the top of the stands to house the coaches and media also gave shadow in the surprisingly warm sun. The stadium has great new field turf with black endzones spelling out DUBOIS with the DuBois Beavers logo at midfield. After the game, I was quick the car and started the 150 mile drive to Erie. 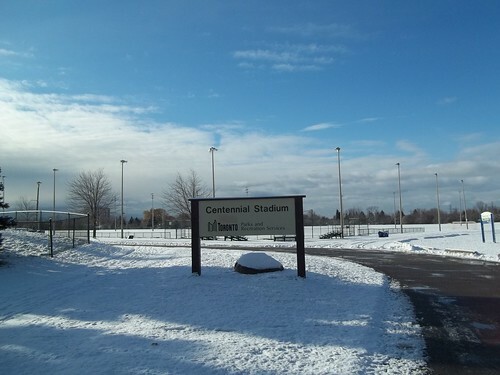 Erie Veterans Memorial Stadium is a large old stadium, but has virtually no parking. The only available is on the streets surrounding the stadium. It isn’t anywhere near a freeway access. And the concessions stadium is only at the top of the stadium in the endzone. The stadium is in a horseshoe shape with ungodly uncomfortable ‘formed’ plastic covers over the old wooden bleachers. The pressbox sits above the top of the homeside stands, which gives cover to a few rows of seats. The stadium seats around 10,000 fans, but was more than enough for the game. Greenville came into the game 11-0 and Girard came in after an emotional win the previous week at Veterans Stadium on Monday after a victory of Sharon. Sharon had just lost two players players in a car accident on Friday and two more were injured. The game had been canceled, but then the players elected to play on Monday. Monday saw abundant lake-effect snow hit Erie and turned the game into a winter wonderland. Girard held on and won thanks to a last second touchdown to win. Despite being the best team in District 10 2A and being crowned Region 3 champions and having beaten the two second best teams (Hickory at their place, and vs. Region 4 champion Northwestern), the game was played much closer to Girard. Near the beginning, it seemed like Greenville would have an easy go of it. Then turnovers started. And they accumulated. Greenville still took the lead late, only to see Girard win it 16-14 when Greenville couldn’t continue their late game drive after stalling out in Girard territory. The season came to a close sadly at 11-1. The third playoff week has traditionally been for me a trip to Heinz Field for the WPIAL Championships. In the PIAA, the WPIAL is officially known as District 7 which covers the southwest corner of the state except for the city schools of Pittsburgh. I had already purchased a ticket for the MMAA championship game between St. Joseph and Canisius for Thursday. I however was rather sick and decided to stay home. I had planned for Friday to be a game in Ohio somewhere. But, again, without feeling well and being in Greenville, I decided for a short drive and again went to Greyhound Stadium for the Lakeview-Sharpsville PIAA District 10 Class 1A Championship. The game was true-to-form with what the preliminary matchups showed. Lakeview had little trouble as Sharpsville just could not get anything going. Their defense fared well, but it didn’t take much for the Lakeview Sailors to grind it out. Feeling better in the morning, it was a drive to Pittsburgh for the WPIAL championships. This was my fourth straight year seeing these games. They aren’t necessarily the best games or best event. However, there are four games so you’ve got decent odds of seeing at least one or two good games during the day. Tickets were $10 for an average of $2.50/game. Program was $5. And parking was $5 in the gold lot right by the stadium. The only downside is you can’t leave and reenter. And concessions here are not cheap. The best deal is the bucket of Quaker Steak & Lube wings. Though they were cold by the time you walk away from the counter with them. As for the games, the WPIAL has recently started to play the 4A game in the second slot so it could be shown live if there’s a Penguins game on at night. This actually works much better for fans as it prevents the two biggest attended games from being back-to-back. The early game featured a Cardinal Wuerl North Catholic team in their last year in Pittsburgh. Next year they’re moving to the Cranberry area. Sto-Rox was considered by many the second best team in the WPIAL 1A this year behind powerhouse Clairton. After Monessen’s regular season upset, it showed Clairton wasn’t the team they were. And Sto-Rox finished them off in the playoffs. However, North Catholic had a stout defense and won in a low scoring shutout. Then the snow came. Central Catholic and Woodland Hills, two teams I’ve seen quite a few times, starting fairly even but the big turning point was a botched play by Woodland Hills after a bad punt by Central Catholic. Though not apparently blocked, but due to the wind the punt never crossed the line of scrimmage. As the players stood around and slowly started walking off the field, the Central Catholic players realized that the whistle hadn’t been blown and with a slew of blockers, picked it up and ran it down the field for a touchdown. After that play, you could tell Woodland Hills was already defeated. Playing close to a better team alone is tough. Getting a punch to the gut and it was hard to keep up after that. The next game was 2A and featured powerful Aliquippa against recent state runner-up South Fayette. Aliquippa kept taking the lead, and yet South Fayette still managed to find a way. Thanks to a late interception, South Fayette moved on again. And in the night game, West Allegheny had a game against Central Valley. In a low scoring cold game, West Allegheny won for the second straight year. As my usual statement about Week 13, the games are close by and relatively inexpensive. Not being able to leave the stadium and being subjected to high prices and the long TV delays the games experience. However, there really isn’t a much better option. Where else can you get four games in one day? This turned out to be my most anticipated football-related trip of the year. After reading about the Buffalo Bills games in Toronto, I found out that the OFSAA had been playing provincial ‘regional’ championships at Rogers Centre the week of the game. It was the first time the OFSAA had inter-regional association playoff games. However, they had their 17 regional associations paired down to five matchups. Played on a Tuesday at Rogers Centre, it was an all-day game of a football. However, they were playing Canadian rules on an American-sized field. Within days of me learning this of this new possible road trip. It was announced that the primary sponsor, Rogers Sportsnet, was backing out and without them the games were in jeopardy. Even with the Bills helping host the games, they were no more. 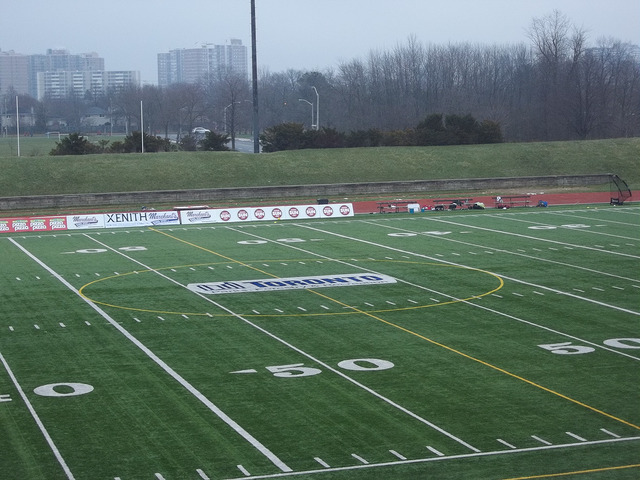 With the OFSAA trying to avoid losing these newly founded provincial games, they instead opted for a small public field in the Toronto neighborhood of Etobicoke to host the games. Instead of five games, it would be nine and they were to be spread out of the week from Tuesday through Friday. Two games a day with an extra game on Wednesday. It was with that announcement, that I knew what me week was going to be. The only issue was Greenville. Had Greenville still been in the playoffs, I had cut the trip short after Friday and driven back to Pennsylvania. Instead, on Thursday night, I would drive to Detroit and see the eight Michigan championships on Friday and Saturday. And to really make it interesting. I’d driven to Pennsylvania Saturday night. Sleep about three hours. Then drive my dad to Cleveland for the Browns game. Then take him home. And then finally get some sleep. Monday afternoon I drove into Canada. Stopping at the Fallsview Casino I wasted some money before calling it a night near St. Catherines. In the morning it was a late morning drive after rush hour on the QEW to Centennial Stadium in Etobicoke. Now, the reason people still call it Etobicoke was that when Toronto consolidated down several suburbs into the city, the city of Etobicoke was one such city. However, legally, Etobicoke no longer exists but in memory. The stadium is part of a sports complex with a hockey arena for rec leagues, kids, etc. There’s many soccer field. And then the football stadium. Seating just over 2,000 it was, unfortunately, more than enough seats for these games. A track surround the very large field. The field turf was nice and new. Seeing a 150-yard by 65-yard field in person doesn’t quite equate to what you see in photos on TV. It is big. Very big. Having two 50-yard lines also looks strange. For what it is, the stadium is nice. Four large light towers stand on each side of the field. The stadium only sits on one side of the field. A small berm is built around the rest of the stadium, giving a bowl-like appearance. The hockey arena stands to the left and downtown Toronto stands to the far right corner. The embarrassingly small scoreboard stands far to the right beyond the track on the berm. Tickets were $4 per day and the small programs were free as long as they had them. Concessions were reasonably priced however they had zero issue with you bringing in outside food or drink. Many people, myself included, would bring Tim Hortons or pizza in with them. The first game I attended in Canada ended 32-1. Lorne Park, a participant of games in Ohio, beat Frontenac. The Tuesday games had decent weather before snow came in overnight. The crowds for both games were decent and the second game ended close. Wednesday was a bit of a stretch. Because of three games and an attempt to keep the games during daylight hours for as long as possible led to a 10am start. Because of the cold, it is a wise idea to play daytime games when not in a dome. However, the crowd was the smallest for a game I had ever seen. It picked up as the game went on. But, at kickoff there were 43 fans in attendance. Richview was from Etobicoke. And yet they had only a handful of fans. West Ferris, meanwhile, was from the town of North Bay, which was 338km away. Unfortunately, the team with the fans did not win. The night cap had some more snow and W.F. Herman of Windsor was taking on Upper Canada College of Toronto. Both teams brought some fans, but Herman is a school that treats their football team almost how a U.S. school would. A good crowd accompanied them for their trip. Thursday was another day for a very small crowd. My rooting interest this day came from Thunder Bay, Westgate. Thunder Bay to Etobicoke is 1,393km. Or, just about 865 miles. And yet they had a bigger crowd than a school from about two miles away the previous day. I was really hopping Westgate would pull it off against St. Mary Catholic. Tied at 7, Westgate scored in the third quarter but missed the convert, to lead 13-7. St. Mary Catholic scored to tie it, and went for two. After a penalty nullified their two-points, the kick was blocked, tying it against at 13-13. I was really hoping for overtime. But, St. Mary Catholic had other ideas, and drove the field. A blown coverage left a man wide open with 4.7 seconds for the game winning touchdown. The last game of my trip to Canada was between Huron Heights of Newmarket and London Catholic Central. Newmarket is a suburb north of Toronto. Many of their teenage fans were wearing their hockey jackets for the Newmarket hockey league’s Newmarket Redmen. Which seemed rather appropriate. Many hockey team hats, jackets, shirts, and jerseys were prevalent in the crowd. For the week, I had a hotel near the airport. Though it’s a Travelodge, it was a very nice hotel. Pricy, but with a discount was for an average mid-range hotel. Only being a few miles from the stadium, it was a quick drive back and forth each day. However, there wasn’t much in the way of restaurants on the trip. And given the games let out during rush hour meant braving heavy traffic, or taking the short way and putting up with it. But, I did get some Pizza Pizza, a chain in Canada. Also, Tim Hortons are as ubiquitous in Canada as McDonalds are in the U.S. They are everywhere. Also tried Poutin. French fries covered in gravy and cheese curds. Actually are very good. Though a bit messy. After the games Thursday it was for the long trek west long the 401 to Detroit. The weather and traffic weren’t that cooperative near Toronto, but once past the 402 opened up and was a decent ride toward Windsor. I stopped for the night and crossed the border in the morning. The border crossing at the Ambassador Bridge was surprisingly quick without any delay. If you’ve never been to Detroit, it’s not in the best of shape. Though Ford Field is located right next to Comerica Park, it’s rather isolated inside the center of downtown. Ford Field, itself, however is very nice. I had seen a baseball game at Comerica Park a few years ago and Ford Field sits across the street and isn’t as dominating as you would think for a modern NFL stadium. That is because it’s sunken into the ground as is Comerica Park. Parking was $6 and was on the northwest corner. Tickets were in the southwest corner. For $10 per day, it wasn’t a bad deal for four games. Programs were $3 inside the rotunda. An old factory was converted into what seems like storefronts. They also had a decent selection. The best was the Big Boys they had. The double-decker was $6, which was a decent price given you couldn’t leave. Crowds for these games were surprisingly good and the entire lower bowl was open for seating. Fans however, did not listen to the announcers at all. It was stated many times to wait in the endzone seating for the previous game to end before trying to find seating along the sidelines. Instead, they would start showing up midway through the previous game, work there way into any open seat they could find in the ‘desirable’ locations, and clog the aisles trying to get down after the game while fans from the earlier game are trying to leave. Then, once those fans started to leave, they’d then move again further towards the center and down. I tended to sit toward the top to get a better view, and for the higher attended games started sitting to the far endzone sidelines. Now, for Michigan, they have four classifications. Yet they crown eight champions. Formerly, they listed this as AA, A, BB, B, CC, C, DD, and D. The four classifications were A, B, C, and D. Depending on how big your school was, would determine whether you were in A or AA, etc. Similar to how Texas had previously had done it. They switched their naming convention to an Ohio format and now list then biggest as Division 1, and the smallest as Division 8. Their playoffs also are independent of league or regional affiliation. The other odd thing about Michigan is that they’ve adopted an Ohio or Texas format in team name designation. In Ohio, all schools are defined by the mailing address city of the high school building. Texas designates based, primarily, on the ISD name of the school, though for the big cities tend to list by the city (Spring Dekaney is referenced as Houston Dekaney; Northside Brennan is listed as San Antonio Brennan), for instance). However, Michigan due to the shrinking population has lost many post offices and have seen some jurisdictions eliminated. However, the original names that these schools have been listed under are still used. For instance, Brother Rice is listed as Birmingham Brother Rice. Due to Post Office consolidation, they are now under the Bloomfield Hills mailing address but still are listed as Birmingham Brother Rice. Despite not being their official name, or where the school official exists. Another oddity is Detroit Catholic Central now exists in the town of Novi, but because the school started in Detroit before moving, the MHSAA still recognizes them sans Novi. Unfortunately for competitiveness, the best game of the weekend was the last. And it was the longest. I was hoping for a quick blowout and could drive to my parents to get my dad in the morning for the Browns game. But, DeWitt had other ideas. Though the Zeeland West Dux were the favorites, DeWitt kept up the pressure and kept nipping at their heels. Eventually, they succumbed, 34-27. After the games on Saturday, it was a long drive east until about 4am. Then at 8am, woke up to get my dad ready for the Browns game and then 90 minute drive to the stadium. Then a 90 minute drive back to take him home. All in all, it was a very long, very fun, week. In all, I saw 15 high school games, and one NFL game in six days. This was an incredibly fun week. If the OFSAA does the same or similar schedule again next year, I’d definitely do it again. As for Michigan, it was fun. And I wouldn’t mind doing it again. Due to a fluke in the stating weeks of the state associations, games are on weekends when they normally wouldn’t. Tickets were decently priced. The hotels that I got were all good for a decent price. Travel for me is always fun. And it was over Thanksgiving when I’m usually not doing much anyways. And once again it was Ohio for Week 15. This was my sixth straight year attending all the OHSAA State Championships at Stark County. For those unfamiliar, the OHSAA titles are split between two stadiums, and alternate between them throughout the day. This year, the state added one more division and put an extra game on Thursday night. Because of the realignment, the rotation was changed and they also made the Division 1 game Saturday in the matinee slot. I was running a little late to Massillon, but stopped and purchased a new camera when I realized I had forgotten my old camera. It was a decision I was planning on already, but this just sped it up. I still managed to get to the stadium on time and spent the whole game adjusting settings and what not. Unfortunately, the Akron SVSM-Trotwood Madison game was a one-sided affair. The hotel I had was cheap, but really wasn’t worth it. It was pretty close to both venues, but that was about the height of my praise. The next day started in Canton at Fawcett Stadium with Kirtland in their third straight appearance against Wayne Trace of Haviland. Though Kirtland lost to Coldwater last year, they were an easy victory away from two wins in three years. At the second slot, was Clarksville Clinton-Massie playing Youngstown Cardinal Mooney. Easily the best game of the day, Clinton-Massie won their second straight in thrilling fashion in a back-and-forth game. A late interception sealed the win in the snow. The night game was a mess of white. Cleveland Glenville in all the games I’ve seen them relied on speed. With the snow slick on the artificial turf, Loveland had an easy time and blew them away in the first half alone. 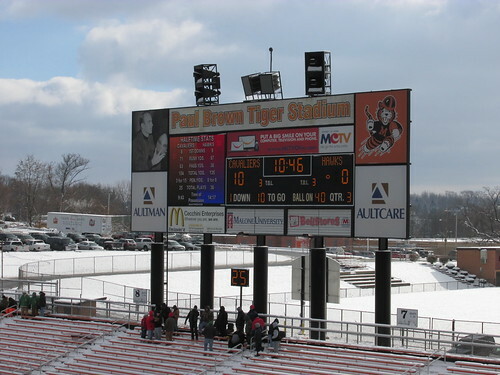 Saturday was back to Paul Brown Tiger Stadium in Massillon for Coldwater against Columbus Bishop Hartley. Coldwater was also making a return trip, for the fourth straight year. After beating Kirtland last year, they had a good game holding Bishop Hartley down. Then was the game of the day on Saturday. Possibly the weekend. Mentor playing Cincinnati Archbishop Moeller. Mentor had yet to win a state championship. Their closest was an overtime loss to Hilliard Davidson. What started as an apparent Moeller blowout was quickly made into a track meet. However Mentor could never make up for a botched quick strike TD by Moeller in the first quarter. They trailed the rest of the way, losing in a barnburner, 55-52. And then the night game was back at Massillon for Maria Stein Marion Local against Cinderella-story Glouster Trimble. Unfortunately it wasn’t even close, as Marion Local won via the second shutout of the weekend. In all, five of the seven champions had defended their title from last year. The lone exception was Kirtland who had lost to Coldwater (who won D5 this year) and Loveland who made their first appearance. Would I do it again? Don’t know. Next year the games will be in Columbus at Ohio Stadium. If it weren’t for the fact Ohio sells their tickets in advance for a discount, which I had already purchased, I may have driven to New Jersey for their games which were the same weekend. In addition to two games Friday and the four games Saturday at MetLife Stadium, the four games at Rutgers’ HighPoint Stadium were being played on Sunday. Which would’ve been ten games. However, Sunday night would’ve been a hell of a drive home. Tickets to the Ohio games are the most expensive of any state. Because each game is individual. At the gate are $10 each, or $8 pre-sale. You can buy a parking pass for $10 for all the games, and get a dollar off your game program. In the end, it still is $8/game just for tickets. This was a week that irked me. As I mentioned about my car, I had more issues with these games. Something about I-80 in Pennsylvania seems to cause problems. This time it was overheating because of a water leak. However, I wasn’t about to drive back to get one of my other cars. Else I would’ve missed most of the early game. I’ve driven the same car to almost all my games, and have taken it on trips as well. Unfortunately, after this week, I’ve retired it. On the way though, I had to stop for gas and noticed tweets from several sources stating that the 4A game on Saturday was being postponed to Sunday due to the impending snowstorm. When I got to the game, it was reported the early game on Saturday, the 2A matchup, was being postponed. Which I’m glad I had slacked off and not booked a hotel in advance for that night. This was the third time seeing the state titles at Hersheypark Stadium in Hershey. 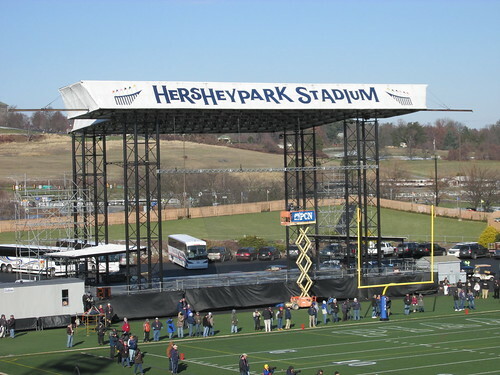 The stadium is located at Hershey Park, adjacent to Hersheypark Arena, in the complex with the park, Chocolate World, and the new arena, the Giant Center. The entrance is odd, as you have to circle around the Giant Center and cross under the entrance to get toward the parking lot for the stadium. Parking is free if you’re attending the high school games (at 7pm the Giant Center had an AHL hockey game as well). This is an old stadium. It’s also in need of a lot of work. The only thing in the stadiums hidden under the arched facade, is the cramped, tiny bathrooms. Food is sold from little carnival trailers parked under the stadium. Tickets, though $8, are good for reentry to the late game on the same day. An added benefit of attending games here. The first game of the day was Cardinal Weurl North Catholic against Old Forge. 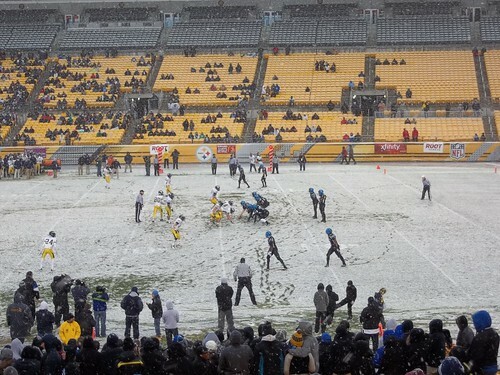 The Trojans and Devils played under pristine conditions for mid-December. What looked like an victory for Old Forge crumbled in their hands as C.W. North Catholic tied it at 7 in the fourth quarter. In my first overtime game of the year, Old Forge had possession first and scored to make it 14-7. North Catholic scored as well. Rather than going for the second overtime where Old Forge would get the ball last, they went for two and were successful. After spending the afternoon around Hershey and returning for the late game it was an all-Catholic school matchup. Erie Cathedral Prep, the defending champion, was upset in the semifinals by Harrisburg Bishop McDevitt. Meanwhile, Archbishop Wood of Warminster were lined up across the field. It was a cold night and Bishop McDevitt, runners-up two years ago, lost a hard fought game but just never could figure out Wood’s offense. The games were cheap, but the stadium is horrible. Getting the Saturday games bumped was a huge let down. If it weren’t for the fact there wasn’t another game within a thousand miles, I would’ve gone elsewhere. In 2003 they had moved the games on Saturday after Friday night had a monster snowstorm dump on the 3A game. The last week of high school football in the United States saw games in Florida, California, and Texas. For the third straight year I was in Arlington, Texas for the UIL Championships. The first two times were extremely fun. And the ride down and back have given me the opportunity to visit some counties I’ve yet to reach. Given that this was the first year that the UIL will have all ten championship games on the same weekend (3AD1 was the previous week usually) and that would put me right at 100 games for the year as well thanks to Pennsylvania and my illness earlier this season. The drive down let me clinch the rest of the counties of Indiana and all but one county of Illinois. And other than the top line of counties in Missouri, I have that part of the state as well. That trip back got the few remaining southern Missouri and Indiana counties. 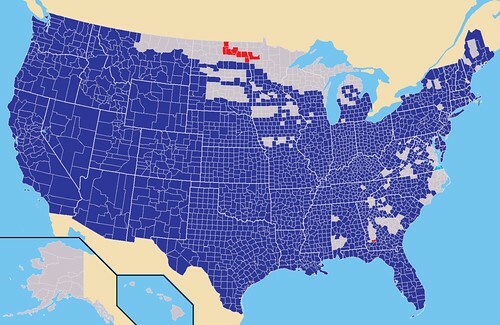 The blue counties are ones I’ve personally driven in. The few remaining red ones were when I was a kid. As for the games themselves. Because of the tenth game, the former symmetrical 3 games a day schedule was revamped to have a fourth game on Thursday. This meant an earlier start and less time between games. It also meant, due to TV, that the games would run well late of their slated times, as they usually are. Thursday was all small schools in the 1A and 2A classifications. It was the third time I’ve seen Stamford play. Cisco and Refugio were playing a rematch of last year. And Cameron Yoe was back again. New teams were Shiner and Falls City which were from the southeast portion of the state. Wall was a small dot on the map just east of San Angelo that I had driven through and, as one resident told me, you would miss it. And I missed it. The remaining team was Wellington. Now, my affinity for Texas High School Football started with the small towns in the northwest corner. I had driven US287 before, and passed by a lot of small towns. Including Memphis, whose stadium sits right on the highway when it turns into a street through town. Towns like Shamrock, Vega, Dumas, Dalhart, Stafford, New Deal, Friona, Canadian, Quanah, Memphis, Wellington, Paducah, Floydada, Wheeler, etc. So many towns I’ve been through in Texas. If you look at the link to the map of counties, I’ve been to every county in Texas. Many for more times than I could count. I’ve always loved these small towns. So, I was so happy to see one of the northwest corner towns make it to the state finals. Wellington did not disappoint, as they obliterated Falls City. For the second day at AT&T Stadium, were two teams I had seen before. And a matchup I was really looking forward to. Denton Guyer is my adopted large school teams in Texas. I had seen them for the first time four years ago in a state semifinal game at SMU’s Ford Stadium in Dallas. They were playing part of a doubleheader with fellow Denton school Denton Ryan. What’s odd about them is the use of blue as a color, yet their uniforms are basically black, silver, and white. Three years ago I saw them in a playoff quadruple-header at Cowboys Stadium. And then the past two years now in the state finals. I’ve been through Denton to see the Denton ISD Stadium, and would hope some day to see a game there. Who knows when or if, but it would be nice. 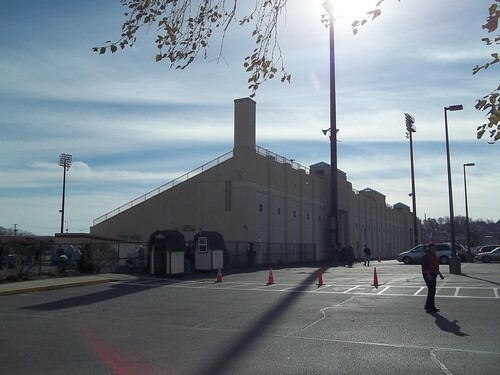 The stadium was built for three high schools, and holds 12,000 total. The other game I was interested in was Carthage-Kilgore. Both teams were known as the Bulldogs (Argyle-Fairfield in the very next game were both the Eagles, oddly enough). Both teams are only 40 miles apart in northeast Texas. I’ve been through Carthage numerous times and have stayed the night in the town. Situated on US59/Future I-69, it’s the first big city you come to south of I-20. Kilgore, on the other hand, is just south of I-20 near Longview. Being so close, it is amazing they would both be in opposing districts and not meet until the state finals. In years prior to the games being at AT&T Stadium (and formerly Cowboys Stadium), the game between these two would be played at a neutral site agreed to between the two participants. More than likely that would’ve been in Tyler or Longview. Instead of a short drive, both teams were 140 and 180 miles from their game location. The game still was a great one, and ended with the Dawgs of Carthage winning. And the last day of football saw three big games. The lead-off was Aledo-Brenham. Aledo became the first team in high school history to score more than 1,000 points in a season. Then Allen-Pearland became the most attended game in Texas high school history. And lastly was a rematch between Cedar Hill and Katy. Aledo had a powerhouse offense, and looked to be contained by a rather stout Brenham Cubs defense. However, Aledo’s defense was more than enough to hold Brenham down as they pulled away in the second half to make the margin worse than the game really was. Playing in the matinee time-slot this year, the 5AD1 championship featured Allen against Pearland. Suburban Dallas vs. suburban Houston. The crowd was thinned at first by the departing Aledo fans, which added to the trouble. It also led to pockets of seats still being open despite opening up the fourth level of seats. Allen’s offense was just unstoppable in this game and ran away with it easily. And the last game of the year was Cedar Hill Longhorns against the Katy Tigers. Cedar Hill had been 1-2 in state finals previously. It was the third time I’d have seen them play. 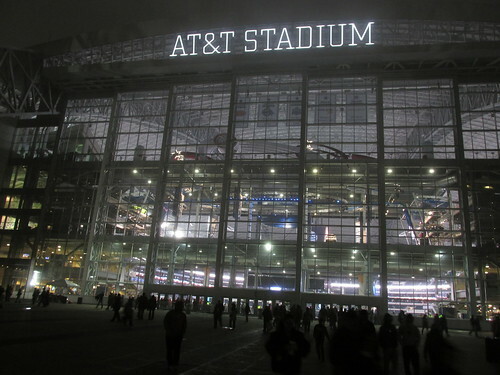 They also played in the quadruple-header at Cowboys Stadium two years ago. Of all eight teams, they were the only ones selling any form of merchandise. Katy on the other hand had won seven championships already, and were in their 12th championship game going for what would be a record-tying 8th championship. The game was sloppy and Katy was easily the favorite. Cedar Hill jumped out to a surprise 10-0 on some theatrics, before Katy came back to take the lead, 14-10. A 24-10 lead looked insurmountable until the improbable happened. Two fumbles and a botched punt snap led to Cedar Hill’s 24 point rally to take a 34-24 lead and hang on to win. One of the funnest games to watch on the year. As for the games, the parking was $10 per day and tickets were $15 per day. This year with my hotel being right by the stadium, I had time for breakfast before the game and usually made it over to Chik-Fil-A. After the games, it was usually pizza. A Wal-Mart right across the street from the stadium and having in-out privileges meant you could get food much cheaper than in the stadium. Although the Chill-brand fruit ice they sell pre-packaged by vendors is well worth the $5. Also, the nachos are good. Probably the best value of anything there. The bottomless popcorns for $10 may sound like a great deal until you get thirsty and realize just how pricy drinks are. All in all, this was a great week. My third straight year attending the final weekend of championships in Texas. Tickets are fairly reasonable ($15/day), and parking isn’t that bad ($10/day). The hotel was cheap ($170 for three days). It’s a fun drive and gives me an end of year vacation. I’ll write a recap of my thoughts on the entire year shortly and post it up as well. If you want to look at photos from the entire season, you can try the link below. Please be aware that until Week 15, I had an older digital camera that wasn’t as high quality as my new camera. A few games I had used my cell phone. Those can usually be pinpointed by the large cross-shaped glare from the stadium lights.